The increase in antibiotic use has been reversed for the first time in England. Doctors prescribed 2.2 million less antibiotics between 2014 to 2015 – reducing from 40.7 million to 38.5 million, data from Public Health England (PHE) shows. The 4.3% decline in antibiotic prescriptions is the first time a reduction in antibiotic use has been seen across the whole healthcare system, the 'English Surveillance Programme for Antimicrobial Utilisation and Resistance’ (ESPAUR) report, said. 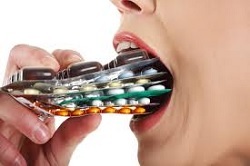 Inappropriate use of antibiotics, such a taking them for viruses like colds and flu, fuels resistance and experts have warned for some diseases there are no effective medicines left. Antibiotic resistance is one of the greatest dangers to our health. Dame Sally Davies, the UK Chief Medical Officer, has described the threat as “catastrophic”. It could lead to people dying from ordinary infections, and routine operations such as hip replacements becoming deadly due to the risk of infection. By safely reducing the number of antibiotics prescribed inappropriately we can combat antibiotic resistance. NICE is currently seeking comments on proposed ‘management of common infections’ guidelines. This suite of guidance will provide evidence-based advice on how common infections can be managed, with the purpose of tackling antibiotic resistance.